Where's The Civilizational Divide In Ukraine? As the ideological division of Europe has disappeared, the cultural division of Europe between Western Christianity, on the one hand, and Orthodox Christianity and Islam, on the other, has reemerged. The most significant dividing line in Europe, as William Wallace has suggested, may well be the eastern boundary of Western Christianity in the year 1500. This line runs along what are now the boundaries between Finland and Russia and between the Baltic states and Russia, cuts through Belarus and Ukraine separating the more Catholic western Ukraine from Orthodox eastern Ukraine, swings westward separating Transylvania from the rest of Romania, and then goes through Yugoslavia almost exactly along the line now separating Croatia and Slovenia from the rest of Yugoslavia. In the Balkans this line, of course, coincides with the historic boundary between the Hapsburg and Ottoman empires. The peoples to the north and west of this line are Protestant or Catholic; they shared the common experiences of European history — feudalism, the Renaissance, the Reformation, the Enlightenment, the French Revolution, the Industrial Revolution; they are generally economically better off than the peoples to the east; and they may now look forward to increasing involvement in a common European economy and to the consolidation of democratic political systems. The peoples to the east and south of this line are Orthodox or Muslim; they historically belonged to the Ottoman or Tsarist empires and were only lightly touched by the shaping events in the rest of Europe; they are generally less advanced economically; they seem much less likely to develop stable democratic political systems. Doesn't Huntington's line, however, not run through the middle of Ukraine, but instead divides the far west of Ukraine (Lviv/Lvov/Lwow/Lemburg, the Carpathians, and the other places ruled by the Austrians and/or the Polish Republic) from the rest of the Ukraine? The far west, such as Galicia, is the stronghold of the Ukrainian Greek Catholic Church, which is in "full communion" with Rome. (Does this mean the priests can marry?) While the rest of the country is kind of divided between Orthodox churches, one reporting to Moscow and another to Kiev. There's a fair amount of evidence that the most dedicated people in the recent Kiev uprising tended to be from Lviv and other points in the far west. 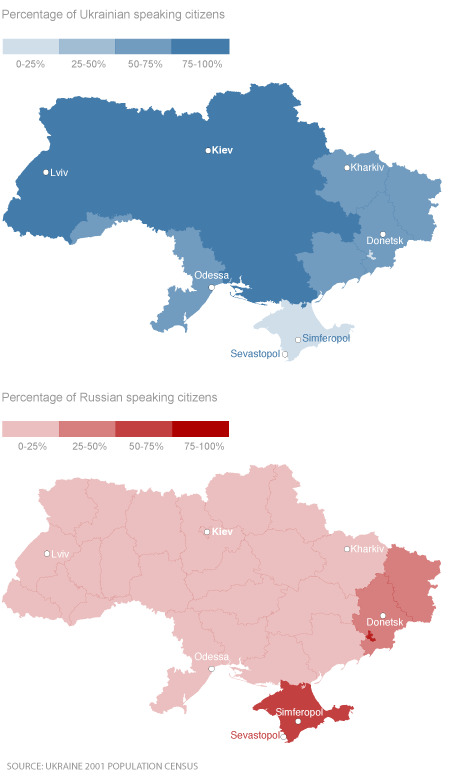 On the other hand, Russian-speakers are concentrated in the east (and Crimea), while the far west and the midwest around Kiev both speak Ukrainian. You might think that the west would be more industrial and the east more rural, but it's the other way around. By way of analogy, think of the American midwest. In the east of the midwest Chicago was a great industrial city, but was also politically kind of backwards, while Iowa to the west was mostly rural but in some ways more advanced. So, language, religion, economy, and history don't line up all that well in Ukraine, which makes it kind of unstable. On the other hand, this blurriness offers room to build compromises. Still, I recall the video from a few days ago of a large number of Ukrainian soldiers courageously jogging up to some worried Russian soldiers, who fired some warning shots in the air, but then the Ukrainians slowly jawboned the Russians into letting them go about their business. I suspect that would have ended much worse if the Ukrainians didn't understand how to talk to the Russians. Of course, neighbors are also most likely to go to war with each other, just like brothers punch each other more than random strangers punch each other.